Two major airports in Maryland are Hagerstown Regional Airport and the Salisbury-Ocean City Wicomico International Airport. The Hagerstown Regional Airport offers free parking, free WiFi, less than an hour's check-in time, and accessibility for people with disabilities. The Maryland airport is also connected to the Pittsburgh International Airport. One of the major airlines operating at this airport is US Airways. 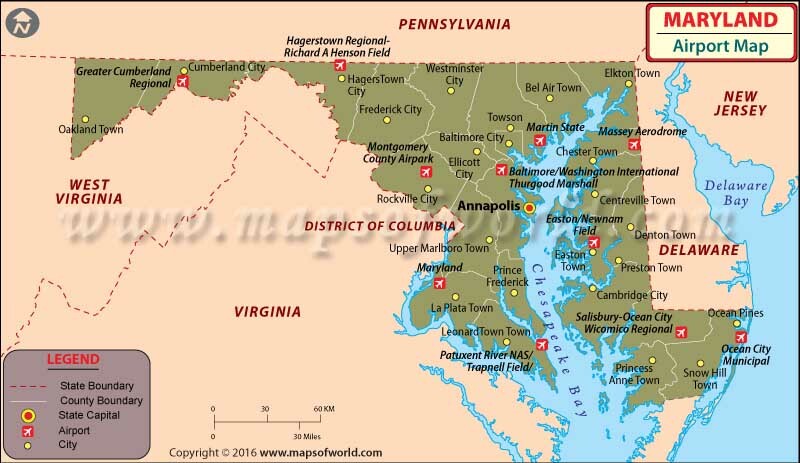 The other important airports in Maryland are in Baltimore, Washington, D.C., and Annapolis. As a public airport, the Tipton Airport is located just south of Fort George G. Meade in Odenton, Anne Arundel County, Marryland. Opened in 1999, the airport is bordered by Fort Meade, the Patuxent Wildlife Center and the National Security Agency. The Tipton Airport is being operated by the Tipton Airport Authority. As a public airport located in the City of College Park, in Prince George's County, Marryland, the College Park Airport is the world's continuously operated airport. It is located south of Paint Branch and Lake Artemesia, east of US Route 1 and the west of Kenilworth Avenue and the College Park Metro/MARC station. Bay Bridge Airport is a county-owned public-use airport. It is located in Stevensille, Maryland and has been named after the nearby Chesapeake Bay Bridge. The airport is mostly used for general aviation. Previously, the airport was also home to Lynn Aviation, the firm owned by aerobatic pilot Nancy Lynn. As a public use airport, the Lee Airport is located in Anne Arundel County, Marryland, United States. It is about five nautical miles southwest of the central business district of Annapolis and is privately owned by the Lee Airport Authority in Edgewater, Marryland. The airport covers an area of 79 acres at an elevation of 34 feet above mean sea level. As a military airport, Philips Army Airfield is located at Aberdeen Proving Ground in Harford County, Maryland, United States. This is a US Army airfield which has three asphalt paved runways. This is a joint civil-military public use airport, which is located about nine nautical miles east of central business district of Baltimore, in the Baltimore County, Maryland. The airport is being operated by the Maryland Aviation Administration on behalf of the Maryland Department of Transportation. All in all, Martin State Airport is a general aviation relief airport.